Ahhh… the wonder of Christmas! The lights, the decorations, the holiday smells. The excitement and anticipation you feel as you’re putting these items out for the holidays. They help create a wonderful experience. And then, BAM, it’s over and you need to put everything away. Not fun, at least not in my house! Putting away the holiday accessories and decorations doesn’t have to be a daunting task. With a little after Christmas organizing you can make it go much easier and it will continue to be easier every year following! We’ve learned to streamline a few things to make it easier over the years. Toss anything that’s broken, anything you haven’t used in several years, or anything you simply just don’t love anymore but keep for some reason, whatever that reason may be. Give everything a home after the holidays. Take an inventory of what you own and what you are planning to keep for the next year. It’s easiest to store like items together. You can get a variety of clear storage boxes to store the various holiday items you need to store. 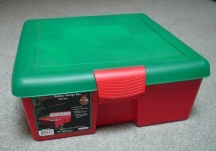 Storage Boxes - Clear plastic storage boxes are a great investment. They keep your holiday decorations dust free and protected and also allow you to more easily stack and see what’s in your boxes, especially when they’re stored up high in an attic or such. We have some large clear plastic bins with lids to store various items, such as lighting in one, garland in another, stockings and tree skirts in yet another, etc. In addition to plain boxes, there are now several types of special boxes on the market to help with your after Christmas organizing! 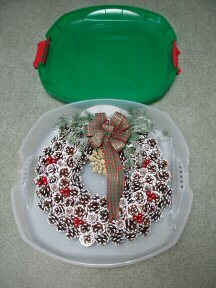 – These are great for preserving a special wreath and preventing it from damage. They’re just the right size and allow you to stack your wreath amongst the other holiday decorations easily. Ornament Boxes – You simply can’t do without these! They help to keep ornaments from clanking against each other and sliding around a larger box. They keep the ornaments easier to access and to put away without needing to individually wrap every single ornament! 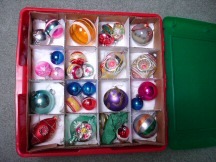 We line each section of the ornament box with tissues and place one or two ornaments in each section of the box. 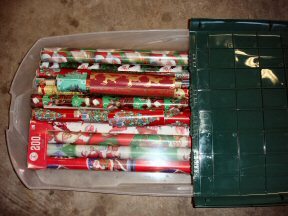 Gift Wrap Organizer – Buying a container for wrapping paper and accessories is a great idea. It keeps all your wrapping gear in one place including gift bags, boxes, tissue paper, labels, bows, ribbon and you can even stash a pair of scissors and some tape in there if you choose just so they’re available and it’s an entire “ready to go” gift wrapping center! There are several varieties available from plain long plastic boxes to soft covered organizers with lots of pockets for ribbons, tissue paper, etc., some of which can be hung on a hanger in your closet for year round use of gift wrapping supplies. Take advantage of after holiday sales! This is the BEST time to get some awesome deals on things including wrapping paper, cards, artificial trees and decorations of all kinds. Granted, things may be somewhat picked over, but if you take the time to browse, you’re certain to find some items you will enjoy. DON’T buy things just because they’re on clearance though…. Only buy things you need (like stocking up on wrapping paper) or decorations that you really adore! 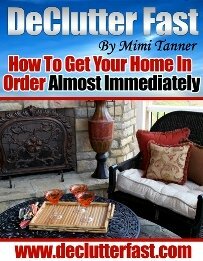 Buying things you don’t love goes against the rules of decluttering and you may just be adding to clutter in your home. So be strong while you’re shopping the sales! Take the initiative to do some after Christmas organizing this year. Clear out your unwanted and broken Christmas decorations and store the rest neatly this year and you’ll have a much easier time pulling out and putting away those decorations next year!